Is an accurate two-minute biopsy viable? December 3, 2018 -- Performing a reliable and cost-effective biopsy in less than two minutes is now possible, thanks to a noninvasive and nondestructive real-time optical imaging device, the head of Paris-based company LLTech Imaging claimed during RSNA 2018. The Light-CT scanner is a high-resolution device for subcellular-level biological tissue imaging, LLTech President Bertrand Le Conte de Poly told health journalist Jean-Claude Durousseaud in a video interview during the Chicago meeting. He revealed in French how the vendor is bringing radiology at a cellular level directly to the patient's bedside. Following a procedure, within two minutes the technology will scan the biopsy with optic tomography and will show both the architecture and the type of cells without the help of a dye, he explained. Specifically, the high-resolution (1-µm 3D) pathology scanner performs optical slicing beneath the tissue surface at selected depths, using two different acquisition methods: full-field optical coherence tomography and dynamic cell imaging. 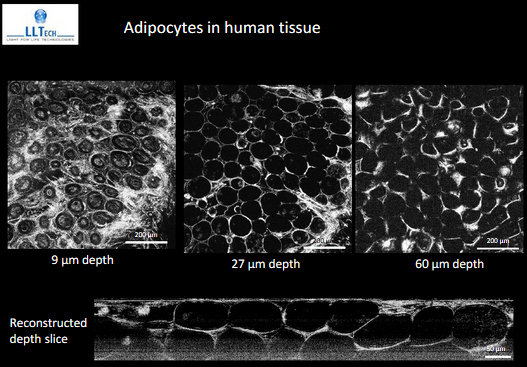 Adipocytes are cells that store energy as fat, mainly triglycerides, in organelles called lipid droplets. Image courtesy of LLTech Imaging. The device produces images showing both the tissue architecture and the intracellular activity data without sample processing or staining, Le Conte de Poly noted. The information can be provided to radiologists in real-time, pointing to a new paradigm for making swift therapy decisions, he added. Currently, standard biopsy assessment can take up to two days. Showing an image of breast tissue biopsied for cancer, Le Conte de Poly said the technology can identify cancerous cells from those of the immunity system and normal glands. The main benefit of the technology is that it is a time-saving device, allowing radiologists to make real-time management decisions in cases of cancer, and a second benefit relates to costs, as doctors don't have to redo biopsies, according to Le Conte de Poly. "In lung biopsies, for example, there is an imperative in personalized medicine to find enough tumoral cells," he said. "The problem is that 20% to 30% of biopsies don't contain enough live tumoral cells. You have to recall patients to repeat the whole procedure." The technology can reduce recalls even for complex biopsies that require hospitalization or anesthesia, he continued. Lung biopsies cost an average of $4,000 in the U.S., which makes recalls very expensive, so any efforts to curb these soaring costs by reducing recall rates are positive news. Another benefit is that the technique doesn't use dye, only light, so a biopsy sample can be completely preserved for any future examinations and reused if needed, without requiring dyes, contrast agents, or tissue freezing, Le Conte de Poly said. He demonstrated the process, describing each step. First, the radiologist takes a biopsy sample, places it in a disposable case, and slides it into the machine. From then on the process is completely automatic. By using light, the machine scans the sample and creates the images. Le Conte de Poly illustrated the type of results to be gained by showing viewers a generated lung biopsy image, in which all the round green cells were cancer, and the yellow spots were immune cells. Furthermore, differences in cell activity can be differentiated. Movement within cells and mitochondrial movement can be captured through high-speed tomographic film that captures 300 images a second.